Joshua Tree Provides Beacon For Artists And Seekers In The California Desert Travel website Atlas Obscura and All Things Considered team up for a West Coast summer road trip from California to Washington. The journey starts in the desert outside Los Angeles. 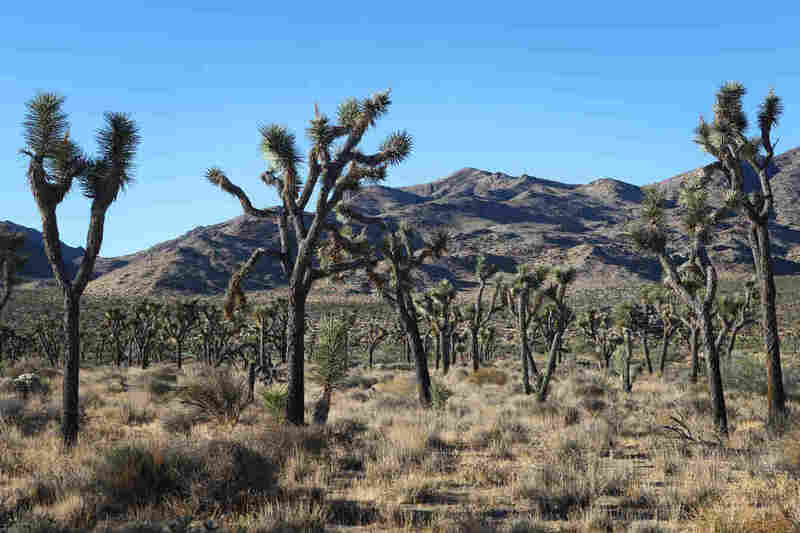 Joshua Tree National Park lies about two hours south of Los Angeles. A really good road trip is defined by the people you're with and the ones you meet along the way as much as what you see. Earlier this summer, ALL THINGS CONSIDERED got on the road with Atlas Obscura, a website that's dedicated to finding and chronicling amazing places. CHANG: Taking turns at the wheel, ATC producer Matt Ozug and Atlas Obscura co-founder Dylan Thuras. They drove 2,200 miles up the West Coast, and we'll be hearing about some of their stops this week. And Dylan Thuras is here with us now to tell us about what to expect and how this all got started. Hey, Dylan. CHANG: So 2,200 miles - how did you guys pick your stops? THURAS: So a few of the places we knew we wanted to go to, but we also did something we often do. We asked people for suggestions about the hidden wonders in their own backyard. So we had people call in and tell us where we should go. And we heard about places that were incredible. Some of them I'd heard of before, and some of them were totally new to me. UNIDENTIFIED PERSON #1: You should try to spend some time in Big Sur. It's breathtaking. UNIDENTIFIED PERSON #3: The Madonna Inn outside San Luis Obispo. And in particular, the urinal in the men's room is something to be seen. CHANG: Wait. Wait. Wait. Someone called and told you to visit a urinal in a men's bathroom? CHANG: Like, garish, loud colors? CHANG: Wait. What am I listening to? THURAS: It's not what you think - not what you think. You step up to this urinal, and it starts a waterfall coming off of it. THURAS: It's pretty delightful, actually. I have to admit I enjoyed it. CHANG: So where else did you guys go? THURAS: As we went up the coast, we stopped in Glass Beach in Fort Bragg, Calif.
GABRIELA ALMEDA: There are shiny rocks that we found. They're glass rocks. THURAS: So that was 4-year-old Gabriela Almeda. And she was telling us about what you see on this beach, which is the remnants of a landfill, basically - a dump. THURAS: Garbage. And tons and tons of bottles were washed out to sea and ground into these beautiful little glass pebbles. CHANG: Oh, that sounds extraordinary. Garbage can be beautiful. CHANG: Where did you start this whole trip? THURAS: So we started in Joshua Tree, Calif., out in the desert. It's got this great kind of artistic community there that gives it a real distinct identity. And if I can, I would love to take you on a little tour of a few of the places that we visited in Joshua Tree. CHANG: Oh, I would love that. Take my hand. THURAS: OK. So right on the main road, you come across a little sign that says, World Famous Crochet Museum. And you come to this bright green Fotomat booth, and it is filled to the brim with hundreds and hundreds of crochet poodles, crochet eggs in tiny crochet pans. THURAS: That is the creation of an artist named Shari Elf. SHARI ELF: These roadside attractions are very much the yin, which is the female side, the mystery, the made-with-love, the wiggly line, which, as we know, crochet is many wiggly lines woven together. THURAS: There's one more place I want to bring you to. And it's in the Sky Village Swap Meet. And as you wind your way through all of these tables with stuff, get to the center of the swap meet, and there's this place called Bob's Crystal Cave. BOB CARR: Open the door. I ain't going to hurt you (laughter). THURAS: That's Bob. The cave itself, it looks basically like - it's manmade. It looks like a Flintstones house has been dropped into an old west environment. But when you go inside, it's like stepping into another universe. It is covered in mirrors. It's got these kaleidoscopic colors, tiny, little trees. And down the center of it runs a stream and a waterfall. It's a deeply magical space. CARR: Surrender. Surrender to you, to every person that comes along. Surrender. Give yourself up. THURAS: The whole point of it for him is interacting with the people he meets as he guides them into the crystal cave. CARR: Hello. How are you? THURAS: And I asked him, you know, why he made it, what he wanted people to get out of it. CARR: Just plain old unexacerbated (ph) joy (laughter). THURAS: He is the embodiment of joy. And I think, for me, you know, you go to a place like Crystal Cave because it sounds beautiful and amazing and interesting. But ultimately, it's the time that we spent with Bob that really makes it valuable. CHANG: Thank you so much, Dylan. CHANG: Dylan Thuras is co-founder of Atlas Obscura. He teamed up with ALL THINGS CONSIDERED for a summer road trip, and we'll take you to his other stops the rest of the week. UNIDENTIFIED PERSON #4: Hey, we're having a tiny concert in the crochet museum. (Singing) Got myself a pad of paper. I got my poster paints (ph).